Warner Bros. & DC's Suicide Squad doesn't hit theaters until August of next year, but with production ramping up, it looks like some of the last pieces are finally being put into place. With the recent-swirling rumors that the main villain in writer/director David Ayer's highly-anticipated film is going to be Antiphon, things just got a bit more interesting. While word of Antiphon taking on the role of top antagonist is still only in the rumor stages, it is nonetheless an exciting prospect. According to Latino Review's El Mayimbe, Antiphon and his special ops team of mercenaries -- a terrorist cell called Onslaught -- are hunting superheroes and villains for their own agenda. Adding to Antiphon's intrigue is the fact that he is a burn victim, as well as an amputee who walks with a prosthetic leg. 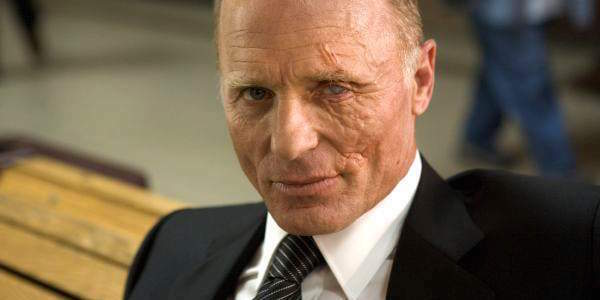 To top things off, Ed Harris, who's name was recently linked to another character in the upcoming supervillain movie, is rumored for the role of Antiphon. Now that's what I'm talking about. Onslaught, who's said to square off against the Squad, has had many incarnations over the years, with Antiphon a member of the most recent group from Suicide Squad comics Vol. 2, #10-12. His other team members have included Digital Djinn, Hyve, Tolteca and Rustam. The super-powered team of international hired-hand terrorists operates out of the DC universe's fictional outlaw nation of Qurac, and has had run-ins with Rick Flag, as well as Amanda Waller (to be played by Viola Davis in the film) -- the latter which the team kidnapped in an elaborate revenge plot against the Suicide Squad. Further, the team succeeded in killing Suicide Squad members Havana and Modem, prior to Deadshot's notorious kill of Onslaught operative Rustam. As you can see, if these rumors are true, fans will be in for a cinematic treat. With Onslaught appearing in more than a dozen issues, there is a wealth of material to pull from and a pool of cool assassins at director David Ayer's fingertips. The only downside I see is that Antiphon's inclusion may translate to the Jared Leto's Joker (described by David Ayer as "majestic") playing a smaller role than previously hoped. Let's pray this is not the case, as all reports thus far on Leto's embodiment have suggested we're in for something special. Most recently an anonymous source called his rendition of the classic DC villain "more cerebral and comedic than what we have seen before," stating the last thing we should be expecting is a "copycat version" of the villain from previous films. Suicide Squad is scheduled to hit theaters Aug. 5, 2016. What do you make of this villainous rumor?